First we have to determine what IBM means by its famous slogan. Here are some of the many meanings of "think": "ponder; reflect (on); believe; consider; cogitate; feel; deem; hold; suppose; imagine; remember; recall; conceive; deliberate; recollect; evoke", etc. Thomas J. Watson, who led IBM from 1914 to 1956, first used this motto in December, 1911 at a sales meeting of a predecessor company, and he explained it as meaning "take everything into consideration". Grammatically, the French "pensons" means "let's think", but I'll leave it to the Francophones who are listening in to tell us what special nuances that may convey. I personally do not believe that this is the Cartesian existential "je pense, donc je suis" ("cogito ergo sum"; "I think, therefore I am"). Now, the crux of this post is that the Chinese rènwéi 认为 ("consider; deem; hold; take to be", etc.) is wrong. It seems strange to see rènwéi 认为 ("consider; deem; hold; take to be", etc.) 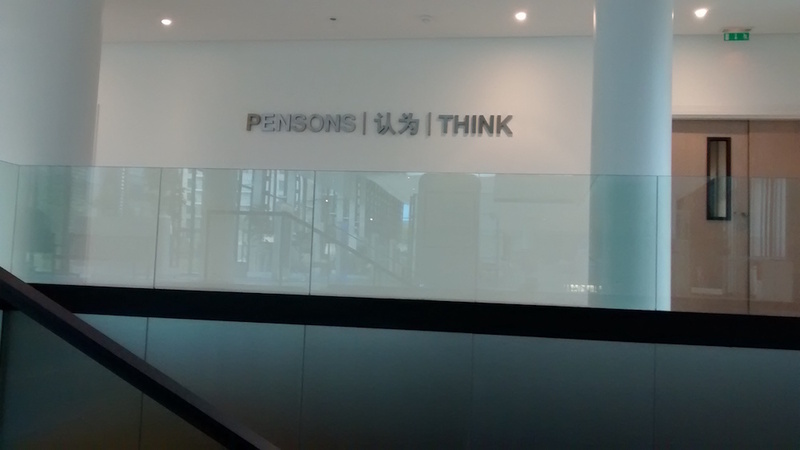 being used as the Chinese translation of the IBM motto "THINK". When I was in high school, I was in awe of IBM as being at the vanguard of science. I subscribed to their magazine called THINK and devoured its every word, thinking / believing that it put me in touch with the most profound minds of the day. Used as the IBM motto, "THINK" is a verb in the imperative mood. It bespeaks Thomas J. Watson enjoining his colleagues and employees to use their brains to improve the quality of their work and the productivity of the corporation. The IBM slogan, "THINK", on the other hand, does not take an object. It is just a simple command to someone to use their brain to perform a mental act. Now, it's very interesting that the IBM motto "THINK" is regularly translated as sīwéi 思维 ("thinking; thought; cogitation; ratiocination") in Chinese, but I don't consider this to be a good translation either. Why? IBM's THINK is a verb in the imperative mood, whereas sīwéi 思维 ("thinking; thought; cogitation; ratiocination") is a noun (those who maintain that Chinese has neither lexical words nor grammatical parts of speech should take note). I have also seen the IBM motto "THINK" rendered in Chinese simply as xiǎng 想 ("think; think of; suppose; miss [someone / something]; wish; believe; feel [like doing]; would like"). This is a verb, all right, but I don't think that it captures the spirit of Thomas J. Watson very well. REFERENCES: photographs #3 and #8 here, and here. These are mostly used as verbs, but can also sometimes function as nouns. My own tentative favorite is xiǎngyīxiǎng 想一想 ("think about it; think it over; give it due consideration; give it a / some thought"), but that's not very elegant. Ah, hard problem. 動腦筋? A bit colloquial. 運神? A bit quirky. But in terms of proximity to THINK!, these seem better. If it's hard to translate the ultimate in pithy slogans into another language, consider how hard it would be to translate the joke posters that appeared ten years later reading, "THIMK". As mentioned above it is more of a command. To me the better translation would be 想吧！It is capitalized after all. Also THINK was not meant to be elegant. The idea was as much (if not more) related to ideas of business and capitalism than it was to a romantic sense of discovering the unknown. Check out Peter Little's history of IBM in Toxic Town, particularly pages 46-47 that discuss the origins of the phrase. I was shocked to see THINK at IBM translated as 认为 “deem" (in the picture). There are lots of Chinese engineers at IBM. Why didn't they have it corrected? On my (Chinese) grandfather's little IBM memo pad from the 1940s, THINK is replaced with 思 only. How about "谋"? It's more "take things into consideration". "想一想" and " 動腦筋" is definitely too informal, at least, not the image that IBM want to establish in China. Thomas J. Watson, who led IBM from 1914 to 1956, first used this motto in December, 1911 at a sales meeting of a predecessor company, and he explained it as meaning "take everything into consideration". The trouble with every one of us is that we don't think enough. We don't get paid for working with our feet — we get paid for working with our heads. We think we think with our brains but, personally, I think with my feet. That's the only way I really come into contact with anything solid. I do sometimes think with my forehead, when I bang into something, but I've seen too many electroencephalograms to believe that there's the slightest trace of a thought in the brain. I also remember Marvin Minsky, poking fun at IBM, writing it like this: "THIИK." Perhaps 思考 would be better? Interesting post to read for me being a native Chinese. "认为" is used in express one's opinions. We translate it to "think" but I guess it's not you want. In modern Chinese(no a term, I just mean "modern"), we use "思考" for "think". "思" or "度" was used in ancient Chinese. "想" is normally in speaking Chinese rather than in formal articles. For "think deeply", the first words come to me is "深思" or "沉思". If you mean "take everything into consideration" we may say "深思熟虑", which is more a adj or a noun, though we sometime use it as a verb. I would suggest "深思" in this case. In my opinion, the most suitable Chinese translation is 聯想，but it's the exact Chinese name of Lenovo, whom IBM has sold their ThinkPad line to. Maybe they just want to cut out any confusion between the brands, then finally put up this very remote translation. "Pensons" is a bit patronizing. It comes across as an exhortation to prayer. It is more imperative than "Think": it implies that the speaker is urging the listeners to think with him right now, whereas "Think" is more detached and long-term. "Pense" (2nd person singular) would be better, except it uses the familiar "tu" form, which is not appropriate. "Pensez" (2nd person plural) could be either the polite singular "you", or the plural, which is too diffuse. Perhaps the best translation consists of more than one word. why not simply "思" ? I was vaguely aware of IBM's "THINK" slogan, but it drifted out of the popular consciousness a long time ago. When Apple created its "think different" ad campaign in the 1990s, the allusion to IBM was pretty tenuous. In fact, Apple later changed the slogan to the Mad LIbs form "V different," where X could be pretty much any V.
As a native Chinese speaker from Taiwan, I'd go with "想". "Pensons" doesn't surprise me at all. As Pierre says above, the connotations aren't quite the same as THINK, but it's so common in French to express instructions in the 1st person, rather than the 2nd as is standard in English – and to a native English speaker like myself, it always feels patronizing, like you're speaking to a child. But obviously to native French speakers it doesn't seem so patronizing. For example, you'll often see training courses with titles like "Je gère les déchets de mon exploitation agricole" ("I manage the waste from my farm"), where in English we would more likely say something like "How to manage the waste from your farm" or "Managing the waste from your farm." There seems to be a certain aversion in written French to the 2nd person imperative especially. Companies are more likely to use the infinitive imperative form than the 2nd person, e.g. "Mettre la machine en marche," which is also used in recipes. I'm not sure if this is because the 2nd person imperative is felt to be too direct and sounds rude, or is simply felt to be less elegant. In IBM's case, however, "PENSER" would no doubt have been far too vague, as it has insufficient context to suggest the intended imperative sense. As always, Aretha Franklin has the last word. The motto for IBM now is 'OBEY'. There is a process and your job has been dumbed down to money level. I think the closest Chinese translation to IBM's 'Think' is actually Lenovo's Chinese name – 联想. In other words, IBM got scooped three decades ago. @ Pierre _ in French would we not be better off with 'Réfléchissez'? I often wondered where the Chinese IBM, i.e., Lenovo, got their Chinese name, Liánxiǎng 联想, which usually means "associate; association (of ideas / thoughts); mental association; connect in the mind" — noun or verb. It's not exactly the same thing as "THINK", but close enough. @philip "Réfléchissez" is good, but it hints of admonition, it seems passive and meditative, like a schoolmaster reprimanding a pupil, "Think about what you've done". I'm leaning towards "Penser". The infinitive form declares an action, a state of mind. In Boca Ratorn on the little notebooks with THINK on them I used to see"
I was told that Thomas J. Watson developed the "think" slogan during his days at National Cash Register which was at the time run by John H. Patterson. Supposedly Patterson saw one of Watson's placards with "think" on it and was so impressed that he put up signs saying "think" all over the NCR factory. For me, "THINK" can be a command to another person, but it also calls to mind someone talking to themselves – I often say "think think think!" to myself when I'm trying to concentrate. I'm not sure it's possible to keep that ambiguity in translation (though French "pense" is awfully tempting) but it seems relevant. What do people say in Chinese when they want to remind themselves to stop and think a moment? We would say "xiǎng yī xiǎng 想一想", as I mentioned in the o.p., or "xiǎngxiǎng 想想", as julie lee mentioned in a comment. These can be a reminder to oneself, as you suggested, or a command to others. There seems to be a certain aversion in written French to the 2nd person imperative especially. Companies are more likely to use the infinitive imperative form than the 2nd person, e.g. "Mettre la machine en marche," which is also used in recipes. The Marseillaise shifts from first person plural ("Allons, enfants de la patrie..") to imperative ("Aux armes, citoyens! Formez vos battaillons!") and then right back again ("Marchons, marchons…") and then leaps clear into the subjunctive ("…qu'un sang impur/ Abreuve nos sillons"). Which is just confusing. I've read many interesting comments. As a French native speaker, it is true that the 2nd person imperative with such a verb is simply to abrupt, sounding almost as a reproach. On the other hand, the infinitive without any complement is just too abstract. The 1st person might be OK, but too easily linked with 'Je pense, donc je suis' (cogito ergo sum). So 1st person imperative is not so bad. The verb 'penser' itself is simply here the simplest and best choice ('réfléchir' is more restricted in meaning, and evokes a somewhat painful work of mind). This is a picture of the IBM France office. Why is Chinese even on the wall in France. How seriously was this planned. That's the main issue. I guess that picking up Chinese here was meant to display some token of globalism using a mysterious script while evoking the future. In fact this inscription has been for display for may be 10 years now. What would be the better translation, I'm not a native Chinese speaker to tell, but 思考, 思, 思索, 深思 seem the better choices. And finally, as an IBMer I learned a lot about IBM's history and its motto 'to think', with very interesting links. hervé: what about 'pensez-y'? Is that any better, or does it eve mean anything? 'Pensez-y', yes, 'mais à quoi ?'. 'Pensez-y' assumes a concrete object ('y') to be thought of, of current relevance for both speaker and interlocutor in the context of current communication, not the case here, I think. Hi Hervé – that is what I am trying to get at, but rather than a specific thing to think about, it is to think about ALL relevant factors in a decision. As in the original explanation … 'and he explained it as meaning "take everything into consideration". For me, but I am not a native French speaker, 'pensons' is too abstract. Also too inclusive … it is the boss, or the organisation, giving an order, an imperative, to the employees.